OccupyDC amuses itself by performorning a citizens arresst on an illegally parked and already ticketed Fox News Van. Recorded at the northwest corner of 17th and K St on January 30th, 2012. Mass arrests, chemical weapons, and nationwide solidarity – the Occupy Wall Street movement was the big story over the weekend – and so too was how hundreds of Americans were screwed out of their constitutional rights to free speech and assembly. More than 400 members of the Occupy movement were arrested Saturday in downtown Oakland as riot police using flash-bang grenades, chemical weapons, and less-lethal rubber-coated steel bullets cracked down on an attempt to occupy a long-abandoned city building. An unknown number of patriots were hospitalized with injuries after the assault by Oakland Police, and at least four journalists were arrested – the most since Mayor Bloomberg‘s midnight raid on Zuccotti Park last November. All-in-all it was an ugly day in Oakland Saturday. As Freddie Mac comes under scrutiny for betting billions on investments that profit if homeowners they issued loans to are locked into high interest mortgages, we speak with Arturo de los Santos, a U.S. Marine veteran who was evicted last year in Riverside, California, after Freddie Mac and JP Morgan Chase foreclosed on his house last June. “We were trying to get the bank’s attention to review our case again. We could not believe that after they had evicted us, they modified our loan,” de los Santos says. “I called them and I told them, ‘I thought we were doing the loan modification.’ And they go, ‘Well, we have a Loan Modification department and a Foreclosure department, and the Foreclosure department decided to sell the house.’ So they sold the house.” De los Santos and his family re-occupied their home in December with help from the Occupy movement, but face eviction again this week. Well, maybe I’m not telling you anything new with this one, but sometimes important thoughts need to be repeated again and again and again, etc. etc. to really sink in. 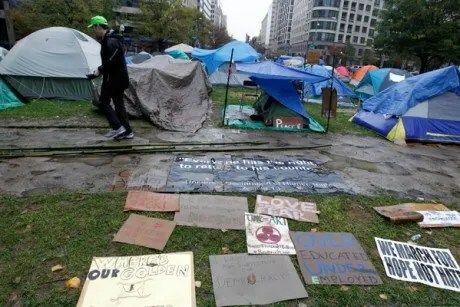 Occupy DC…….. Nearing an End or Just a New Beginning? As the noon deadline from the U.S. Park Police drew near, McPherson Square filled with Occupiers, supporters, reporters and bystanders for what was supposed to be a near final confrontation between police and occupiers over the enforcement of the no camping in the park regulation. But the police never showed, instead the demonstrators draped the statue of General James Birdseye McPherson, the only commander of a Union army to die in the field, with a huge blue tarp from the neck down, like a giant skirt attached at the bottom to the wrought Iron perimeter fence. Inside there was enough space to hold scores of smaller tents and open space where Occupiers celebrated. Bystanders, mostly from the surrounding downtown Washington office buildings, strolled through on their lunch break, and most expressing some degree of support. Have we surpassed Orwell’s “1984”? We continue to see a level of fraud by corporations and the wealthiest people that would make Skeletor blush. And the most amazing part is that they’re able to look good doing it. Is Nathan Kleinman The First “Occupy” Candidate For Congress ? Meet Nathan Kleinman, an Occupy Philadelphia activist who has just announced that he is running for Congress in Pennsylvania against moderate Democrat Allyson Schwartz. Lee Camp performed live in our nation’s capital just last week, on the four-month anniversary of Occupy Wall Street. Immediately following this performance the thousands who were there stormed the steps of the Supreme Court and the White House.